Bill Brennan is one of the oldest fans in the scene, and was also, at one time, one of the youngest. 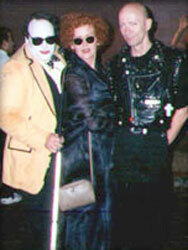 Bill first went to Rocky Horror on his 15th birthday in 1980, and joined the Linden, NJ cast the very next night. The week after that he attended his first showing of RHPS in New York's 8th Street Playhouse and joined that cast as well. As the years went by, Bill wandered from part to part: in his younger, thinner years he was a Riff Raff, and as time went on, he gravitated towards Eddie and Criminologist. His "second love" is Shock Treatment, and he loves playing Bert Schnick most of all. Bill has produced many live Rocky Horror events at various night cubs in Manhattan in the late 80's to early 2005 including The Limelight, Palladium, The Vault, Hellfire Club, and other various events. Bill retired from the NYC RHPS cast as a full time member in May of 2000, completing a 20 year non-stop run as a devoted performer, but continues to guest perform now and then in NYC and attends the RHPS conventions when he can... and will be a devoted fan, in his heart, to Rocky Horror until the day he dies.